I heard the Old Man Emu springs are good for truck duty. They don't give much lift and they're not a sooper dooper crawler 20 inches of flex spring. Old man emu or make custom packs with some extra junk yard springs and fresh bushings, maybe add extended shackles. I have been very happy with reworked old springs and I am very happy with my Emu springs now. If you are looking for a cush ride, make your own because you can tune until you get the ride and height you want and if you are more focused on truck duty get the Emu. The emu don't ride bad but they definitely have a break in period. 63" Chevy rear springs are a good option too but not a bolt on. Consider the CS010. It's a CS009 with an extra add a leaf. 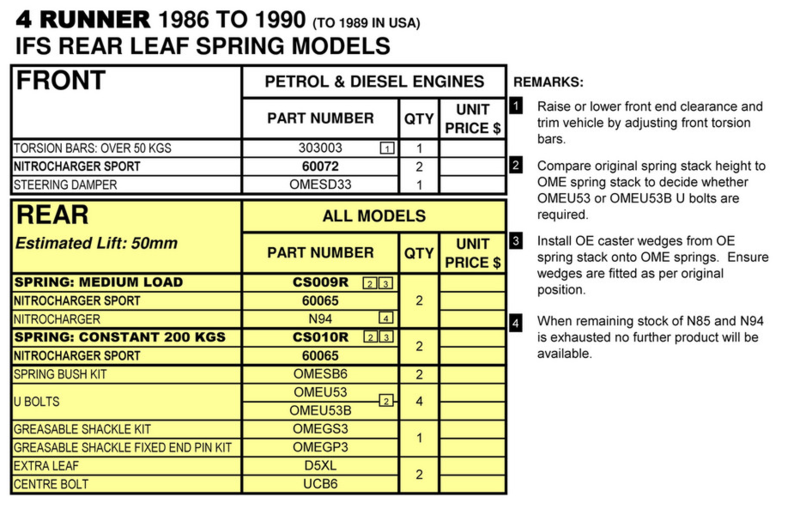 Cheaper to get the CS010 now rather than add a leaf to a CS009 later. The OME springs use the same eye bushing on each end of the spring unlike stock springs which used 2 different sizes. If you want an 1 1/2-2" lift you will not need to add extended shackles to the emu springs. The stock length shackles will work fine for what you are after. A little longer shock would be good. You won't need an add-a-leaf with the emu springs, they have plenty of extra load carrying capacity over stock. You could order the CS010 like emsvitil suggested if you are worried about it and remove a leaf if you find them too stiff. FYI the wheel openings are not at the same height. So that's not a valid measuring system. You tow a 10k lbs camper with an 88 4Runner? I had a add aleaf in my 83 and it brought the rear up and handled a considerable amount of weight and was good at high speeds. I believe it was a rough country or a tough country. I think the only difference is between the generations. 1986 and above obviously won't have front leaf springs, and the lengths for the rears are different. If you have a 4runner I'd get 4runner springs over pickup springs to err on the side of caution. I'm pretty sure the part number is the same between pickups and 4runners, though. If you have a 1st gen 4runner, all the 1st gen 4runner springs should work. CS009R is pretty much the same rear spring for these trucks. I think the differencebetween the 4Runner and pickup springs is a slightly higher load carrying capacity in order to level the 4Runner in the back. Because the 4runners had the extra weight of the top and seats they tended to ride a bit low in the back on the factory springs because Toyota used the same springs in both models. OME is remedying the situation with the different springs for the different models. Yes I'd agree with 4Runners having saggy rear ends, but regardless of what you have ARB is going to send you the CS009R. It would appear to me that AllPro (trail gear ) even sells the same spring for 4Runner or pickup. Does anybody know if energy suspension bushings MCSU-1724 will fit old man emu CS009R leaf springs? Unlike the stock springs and everybody else, the CS009R (& 10R) have the same size bushing front and rear. You either need the OME bushings or to buy the bushings individually. I installed Old Man Emus but didn't like them. I found them way too stiff, and raised it too much. I ended up pulling them off and rebuilding my Toyota spring pack using a leaf out of the old Man. Essentially an add-a-leaf the hard, expensive way. If you decide on Old Man Emu make sure to get a set of bushings. At least they weren't included in my order. You should be able to reuse the same shocks. Least I did. The problem with raising the rear on a IFS 4Runner is the way to raise the front is to adjust the torsion springs. In theory you have about 1.5” available. But the more you crank it up the harsher the ride gets, and at the max it’s really bad. Plus, I gotta think that’s gotta be pretty stressful on the upper ball joints. After modifying my rear springs, and setting the front measurement pretty close to stock I measured the height from ground to wheel opening lip. My front was about 1” higher than the rear. 36”/35”. I do have 31x10 tires. You can lift the front w/o cranking the torsion bars by using ball-joint spacers. The difference in height is due to the wheel openings not being the same to begin with. For the first generation N60 series Hilux Surf and export specification 4Runner introduced in 1983, Toyota, instead of developing an entirely new model, modified the existing Hilux (N50/N60/N70) with short-bed pickup body. The Hilux had undergone a major redesign in 1983 for the 1984 model year. Changes included the removal of the panel with integrated rear window from behind the front seats, the addition of rear seats, and a removable fiberglass canopy. The implementation was borrowed from both the second generation Ford Bronco, and the Chevrolet K5 Blazer, both short-bed trucks with removable fiberglass shells over the rear sections and having bench seats installed in the back. Like the Bronco and the Blazer, the Hilux Surf/4Runner also did not have a wall attached to the front section behind front seats as the regular Hilux did. In that sense, all three vehicles were not conventional pickup trucks with a fiberglass shell included. Thus, the first generation is nearly mechanically identical to the Toyota Hilux. All first generation 4Runners had two doors and were indistinguishable from the pickups from the dashboard forward. Nearly all changes were to the latter half of the body; in fact, because the rear springs were not upgraded to bear the additional weight from the rear seats and fiberglass top, these early models tended to suffer from a sagging rear suspension. Yes, someone had pointed out earlier in the thread you can’t compare the height of the front to the rear since they have different dimensions. And I’m not saying the 1” difference is spec. Just reasonably close. I’d love to get the rear down another 1/2” , but it took a lot just to get it this close.